The challenge and mental dilemma I’ve been faced with for years is trying to differentiate a “lead” or “lead generation” from a normal everyday contact. What’s the difference? Is there a difference? Regardless of what you call or refer to them as, they are a person, a human being right? Whether they find you and contact you from your website, on ActiveRain, from a social media site like Facebook, Twitter, or Youtube or from the “For Sale Sign” in the yard, they are still a person and a human being?!? I don’t want to be referred to as a “LEAD” in your satchel if I were inquiring about buying a home or getting a loan from you. This might be one of the biggest purchases and ordeals in my lifetime? It’s not the same as being referred to as a consumer, a contact, or even a patron. Just sayin…. The phrase “lead generation” became a common term when 3rd party sites and vendors started prospecting for business in ways that many agents couldn’t, shouldn’t, or wouldn’t, and then those 3rd party prospectors tried to sell those interested contacts or (leads) back to perspective agents… lead generation. Now I’m no expert at this “LEAD” stuff, and these are just my personal thoughts here, but if one person can make a difference in the world, and if it is to be, it is up to me, then I’m making a motion and proposal to change the term “Lead Generation” to “Contact Generation” and when we refer to a “Lead” in real estate, we change it to a “contact” instead. This became blatantly obvious to me when I joined Zillow and saw that buyers and sellers were “contacting” our agents and members directly. 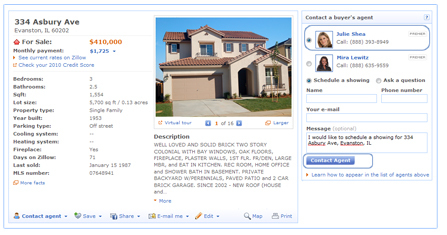 The Zillow Buyer’s Agent List is where consumers actively contact you after they’ve started their quest and journey for data and information. These are “Real People” looking at homes, loans, neighborhoods, and real estate information. They are real “contacts” and I bet they prefer to be called something other than a “lead” too. Zillow opens many doors to the real estate journey for contacts and they/we rely on you to help close those doors and transactions with the homes that they love! FYI – Zillow also operates the most popular platform of mobile real estate applications across iPhone, iPad, Android and blackberry. Attract active leads contacts right from where you want them – in front of a home for sale or while browsing in a neighborhood. 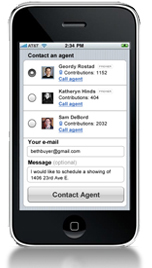 Leading Contacts To Closings and Referrals.